M&A overcame the challenges associated with designing and permitting this facility through close coordination with regulators and stakeholders. Currently in the final design stage, the LARF is expected to recharge at least 78B gallons of water and store up to 6,000 AF/yr of Class A+ treated municipal effluent in an area of extensive historical groundwater depletion. The LARF is owned and operated by Liberty Utilities, with the CAP (through its replenishment arm, CAGRD) providing funding in exchange for a 100-year water supply to help meet its replenishment obligations. 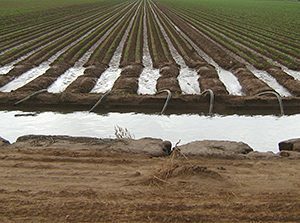 The source of effluent is Liberty’s Palm Valley Water Reclamation Facility (WRF). The permitting process presented considerable challenges because the areas surrounding the site featured other recharge facilities, sensitive land uses, and potential contaminant sources — which could potentially cause unreasonable harm. 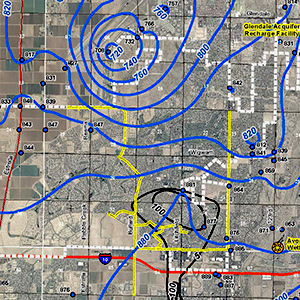 We needed to project groundwater level rise and thoroughly address issues associated with the Buckeye waterlogged area, Glendale Landfill, sand and gravel pits, existing recharge facilities, known environmental sites, and Luke Air Force Base, among others. M&A provided a range of hydrogeologic services to select an optimal location for the project, investigate the selected site’s recharge feasibility, and support the facility’s design.